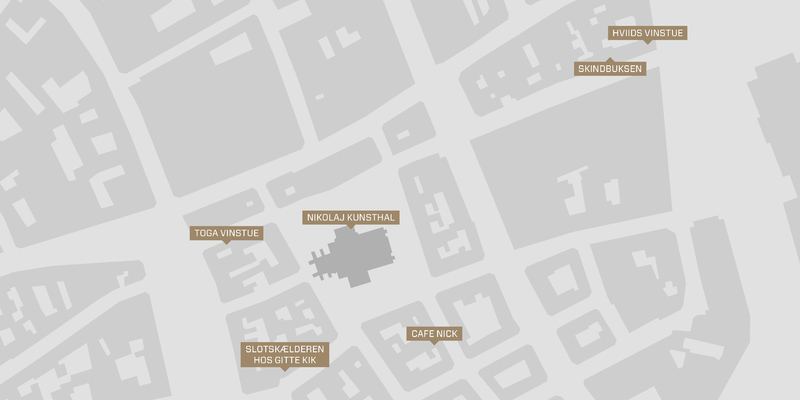 From the 1920’s onwards, the area around Nikolaj Plads was nicknamed Minefeltet (”The Minefield”) due to the public houses scattered in the streets there. Here, writers and artists came to seek the company of each other, exchange points of view and life experiences; and for some, these pubs functioned almost as a kind of studio. One of these was artist Troels Lybecker (b. 1931) who has made hundreds of drawings of the guests frequenting these places. The exhibition ART IN THE MINEFIELD presents a selection of Lybecker’s portraits in interplay with the works of a younger artist, Christian Finne (b. 1974). Finne has been an active part of the pub milieu around “Byens Kro”, and in his art he works with different kinds of mind expansion. ART IN THE MINEFIELD revolves around the search for identity through Lybecker’s portrait drawings along with Finne’s new video works created specifically for this exhibition. ART IN THE MINEFIELD also involves the still existing Minefield pubs: Hviids Vinstue, Skindbuksen, Toga, Café Nick and Slotskælderen/Gitte Kik. During the exhibition period, guided tours will be arranged where the story of these places will be told and the artworks hung there can be seen. See more on the Nikolaj Kunsthal homepage. A booklet will be published for this exhibition with a text on the Minefield by city historian Allan Mylius Thomsen, while art critic Torben Weirup in his article presents a historical outline of the pubs that have played a central role to the Copenhagen art environments from the 1970’s till today. Troels Lybecker was born 1931 and was educated from The Royal Danish Academy of Fine Arts in 1961. Christian Finne was born 1974 and was educated from The Royal Danish Academy of Fine Arts in 2005.